"Aryan," a word that today evokes images of racial hatred and atrocity, was first used by Europeans to suggest bonds of kinship, as Thomas Trautmann shows in his far-reaching history of British Orientalism and the ethnology of India. When the historical relationship uniting Sanskrit with the languages of Europe was discovered, it seemed clear that Indians and Britons belonged to the same family. Thus the Indo-European or Aryan idea, based on the principle of linguistic kinship, dominated British ethnological inquiry. In the nineteenth century, however, an emergent biological "race science" attacked the authority of the Orientalists. The spectacle of a dark-skinned people who were evidently civilized challenged Victorian ideas, and race science responded to the enigma of India by redefining the Aryan concept in narrowly "white" racial terms. 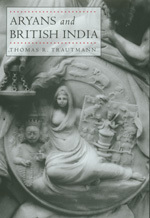 By the end of the nineteenth century, race science and Orientalism reached a deep and lasting consensus in regard to India, which Trautmann calls "the racial theory of Indian civilization," and which he undermines with his powerful analysis of colonial ethnology in India. His work of reassessing British Orientalism and the Aryan idea will be of great interest to historians, anthropologists, and cultural critics. Thomas R. Trautmann is Professor of History and Anthropology at the University of Michigan and author of Lewis Henry Morgan and the Invention of Kinship (California, 1987) and Dravidian Kinship (1982).